Unlike many of the topics addressed by physics, color is far from abstract. Numerous expressions in daily life describe the relationship between energy and color: "red hot," for instance, or "blue with cold." In fact, however, red—with a smaller frequency and a longer wavelength than blue—actually has less energy; therefore, blue objects should be hotter. The phenomenon of the red shift, discovered in 1923 by American astronomer Edwin Hubble (1889-1953), provides a clue to this apparent contradiction. As Hubble observed, the light waves from distant galaxies are shifted to the red end, and he reasoned that this must mean those galaxies are moving away from the Milky Way, the galaxy in which Earth is located. To generalize from what Hubble observed, when something shows red, it is moving away from the observer. The laws of thermodynamics state that where heat is involved, the movement is always away from an area of high temperature and toward an area of low temperature. Heated molecules that reflect red light are, thus, to use a colloquialism, "showing their tail end" as they move toward an area of low temperature. By contrast, molecules of low temperature reflect bluish or purple light because the tendency of heat is to move toward them. There are other reasons, aside from heat, that some objects tend to be red and others blue—or another color. Chemical factors may be involved: atoms of neon, for example, can be made to vibrate at a particular wavelength, producing a specific color. In any case, the color that an object reflects is precisely the color that it does not absorb: thus, if something is red, that means it has absorbed every color of the spectrum but red. The placement of colors on the electromagnetic spectrum provides an answer to that age-old question posed by generations of children to their parents: "Why is the sky blue?" Electromagnetic radiation is scattered as it enters the atmosphere, but all forms of radiation are not scattered equally. Those having shorter wavelengths—that is, toward the blue end of the spectrum—tend to scatter more than those with longer wavelengths, on the red and orange end. Yet the longer-wavelength light becomes visible at sunset, when the Sun's light enters the atmosphere at an angle. In addition, the dim quality of evening light means that it is easiest to see light of longer wavelengths. This effect is known as Rayleigh scattering, after English physicist John William Strutt, Lord Rayleigh (1842-1919), who discovered it in 1871. Thanks to Rayleigh's discovery, there is an explanation not only for the question of why the sky is blue, but why sunsets are red, orange, and gold. On the subject of color as children perceive it, many a child has been fascinated by a rainbow, seeing in them something magical. It is easy to understand why children perceive these beautiful phenomena this way, and why people have invented stories such as that of the pot of gold at the end of a rainbow. In fact, a rainbow, like many other "magical" aspects of daily life, can be explained in terms of physics. A rainbow, in fact, is simply an illustration of the visible light spectrum. Rain drops perform the role of tiny prisms, dispersing white sunlight, much as scientists before Newton had learned to do. But if there is a pot of gold at the end of the rainbow, it would be impossible to find. In order for a rainbow to be seen, it must be viewed from a specific perspective: the observer must be in a position between the sunlight and the raindrops. Sunlight strikes raindrops in such a way that they are refracted, then reflected back at an angle so that they represent the entire visible light spectrum. Though they are beautiful to see, rainbows are neither magical nor impossible to reproduce artificially. Such rainbows can be produced, for instance, in the spiral of small water droplets emerging from a water hose, viewed when one's back is to the Sun. People literally live and die for colors: the colors of a flag, for instance, present a rallying point for soldiers, and different colors are assigned specific political meanings. Blue, both in the American and French flags, typically stands for liberty. Red can symbolize the blood shed by patriots, or it can mean some version of fraternity or brotherhood. Such is the case with the red of the French tricolor (red-white-blue); likewise, the red in the flag of the former Soviet Union and other Communist countries stood for the alleged international brotherhood of all working peoples. In Islamic countries, by contrast, green stands for the unity of all Muslims. These are just a few examples, drawn from a specific realm—politics—illustrating the meanings that people ascribe to colors. Similarly, people find meanings in images presented to them by light itself. In his Republic, the ancient Greek philosopher Plato (c. 427-347 B.C. ) offered a complex parable, intended to illustrate the difference between reality and illusion, concerning a group of slaves who do not recognize the difference between sunlight and the light of a torch in a cave. Modern writers have noted the similarities between Plato's cave and a phenomenon which the ancient philosopher could hardly have imagined: a movie theatre, in which an artificial light projects images—images that people sometimes perceive as being all too real—onto a screen. People refer to "tricks of the light," as, for instance, when one seems to see an image in a fire. One particularly well-known "trick of the light," a mirage, is discussed below, but there are also manmade illusions created by light, shapes, and images. An optical illusion is something that produces a false impression in the brain, causing one to believe that something is as it appears, when, in fact, it is not. When two lines of equal length are placed side by side, but one has arrows pointed outward at either end while the other line has arrows pointing inward, it appears that the line with the inward-pointing arrows are shorter. This is an example of the ways in which human perception plays a role in what people see. That topic, of course, goes far beyond physics and into the realms of psychology and the social sciences. Nonetheless, it is worthwhile to consider, from a physical standpoint, how humans see what they see—and sometimes see things that are not there. Because they can be demonstrated in light waves as well as in sound waves, diffraction and interference are discussed in separate essays. As for refraction, or the bending of light waves, this phenomenon can be seen in the familiar example of a mirage. While driving down a road on a hot day, one may observe that there are pools of water up ahead, but by the time one approaches them, they disappear. Of course, the pools were never there; light itself has created an optical illusion of sorts. As light moves from one material to another, it bends with a different angle of refraction, and, though, in this instance, it is traveling entirely through air, it is moving through regions of differing temperature. Light waves travel faster through warm air than through cool air, and, thus, when the light enters the area over the heated surface of the asphalt, it experiences refraction. The waves are thus bent, creating the impression of a reflection, which suggests to the observer that there is water up ahead. HOW THE EYE SEES COLOR. White, as noted earlier, is the combination of all colors; black is the absence of color. Where ink, dye, or other forms of artificial pigmentation are concerned, of course, black is a "real" color, but in terms of light, it is not. In the same way, the experience of coldness is real, yet "cold" does not exist as a physical phenomenon: it is simply the absence of heat. The mixture of pigmentation is an entirely different matter from the mixture of light. In artificial pigmentation, the primary colors—the three colors which, when mixed, yield the remainder of the shades on the rainbow—are red, blue, and yellow. Red mixed with blue creates purple, blue mixed with yellow makes green, and red mixed with yellow yields orange. Black and white are usually created by using natural substances of that color—chalk for white, for instance, or various oxides for black. For light, on the other hand, blue and red are primary colors, but the third primary color is green, not yellow. From these three primary colors, all other shades of the visible spectrum can be made. The mechanism of the human eye responds to the three primary colors of the visible light spectrum: thus, the eye's retina is equipped with tiny cones that respond to red, blue, and green light. The cones respond to bright light; other structures called rods respond to dim light, and the pupil regulates the amount of light that enters the eye. The eye responds with maximum sensitivity to light at the middle of the visible color spectrum—specifically, green light with a wavelength of about 555 nm. The optimal wavelength for maximum sensitivity in dim light is around 510 nm, on the blue end. It is difficult for the eye to recognize red light, at the far end of the spectrum, against a dark background. However, this can be an advantage in situations of relative darkness, which is why red light is often used to maintain vision for sailors, amateur astronomers, and the military on night maneuvers. Because there is not much difference between the darkness and the red light, the eye adjusts and is able to see beyond the red light into the darkness. A bright yellow or white light in such situations, on the other hand, would minimize visibility in areas beyond the light. Prehistoric humans did not know it, but they were making use of electromagnetic radiation when they lit and warmed their caves with light from a fire. Though it would seem that warmth was more essential to human survival than artificial light, in fact, it is likely that both functions emerged at about the same time: once humans began using fire for warmth, it would have been a relatively short time before they comprehended the power of fire to drive out both darkness and the fierce creatures (for instance, bears) that came with it. These distant forebears advanced to the fashioning of portable lighting technology in the form of torches or rudimentary lamps. Torches were probably made by binding together resinous material from trees, while lamps were made either from stones with natural depressions, or from soft rocks—for example, soap-stone or steatite—into which depressions were carved by using harder material. Most of the many hundreds of lamps found by archaeologists at sites in southwestern France are made of either limestone or sandstone. Limestone was a particularly good choice, since it conducts heat poorly; lamps made of sandstone, a good conductor of heat, usually had carved handles to protect the hands of the user. ARTIFICIAL LIGHT IN PRE-MODERN TIMES. The history of lighting is generally divided into four periods, each of which overlap, and which together illustrate the slow pace of change in illumination technology. First was the primitive, a period encompassing the torches and lamps of prehistoric human beings—though, in fact, French peasants used the same lighting methods depicted in nearby cave paintings until World War I. Next came the classical stage, the world of Greece and Rome. Earlier civilizations, such as that of Egypt, belong to the primitive era in lighting—before the relatively widespread adoption of the candle and of vegetable oil as fuel. Third was the medieval stage, which saw the development of metal lamps. Last came the modern or invention stage, which began with the creation of the glass lantern chimney by Leonardo da Vinci (1452-1519) in 1490, culminated with Thomas Edison's (1847-1931) first practical incandescent bulb in 1879, and continues today. At various times, ancient peoples used the fat of seals, horses, cattle, and fish as fuel for lamps. (Whale oil, by contrast, entered widespread use only during the nineteenth century.) Primitive humans sometimes used entire animals—for example, the storm petrel, a bird heavy in fat—to provide light. Even without such cruel excesses, however, animal fat made for a smoky, dangerous, foul-smelling fire. The use of vegetable oils, a much more efficient medium for lighting, did not take hold until Greek, and especially, Roman times. Animal oils remained in use, however, among the poor, whose homes often reeked with the odor of castor oil or fish oil. Because virtually all fuels came from edible sources, times of famine usually meant times of darkness as well. The candle, as well as the use of vegetable oils, dates back to earliest antiquity, but the use of candles only became common among the richest citizens of Rome. Because it used animal fat, the candle was apparently a return to an earlier stage, but its hardened tallow actually represented a much safer, more stable fuel than lamp oil. Lighting technology in the period from about 1500 to the late nineteenth century involved a number of improvements, but in one respect, little had progressed since prehistoric times: people were still burning fuel to provide illumination. This all changed with the invention of the incandescent bulb, which, though it is credited to Edison, was the product of experimentation that took place throughout the nineteenth century. As early as 1802, British scientist Sir Humphry Davy (1778-1829) showed that electricity running through thin strips of metal could heat them enough to cause them to give off light—that is, electromagnetic radiation. Edison, in fact, was just one of several inventors in the 1870s attempting to develop a practical incandescent lamp. His innovation lay in his understanding of the parameters necessary for developing such a lamp—in particular, decreasing the electrical resistance in the lamp filament (the part that is heated) so that less energy would be required to light it. On October 19, 1879, using low-resistance filaments of carbon or platinum, combined with a high-resistance carbon filament in a vacuum-sealed glass container, Edison produced the first practical lightbulb. Much has changed in the design of light-bulbs during the decades following Edison's ingenious invention, of course, but his design provided the foundation. There is just one problem with incandescent light, however—a problem inherent in the definition and derivation of the word incandescent, which comes from a Latin root meaning "to become hot." The efficiency of a light is determined by the ratio of light, or usable energy, to heat—which, except in the case of a campfire, is typically not a desirable form of energy where lighting is concerned. Amazingly, only about 10% of the energy output from a typical incandescent light bulb is in the form of visible light; the rest comes through the infrared region of the spectrum, producing heat rather than light that people can use. The visible light tends to be in the red and yellow end of the spectrum—closer to infrared—but a blue-tinted bulb helps to absorb some of the red and yellow, providing a color balance. This, however, only further diminishes the total light output, and, hence, in many applications today, fluorescent light takes the place of incandescent light. A laser is an extremely focused, extremely narrow, and extremely powerful beam of light. Actually, the term laser is an acronym, standing for L ight A mplification by S imulated E mission of R adiation. Simulated emission involves bringing a large number of atoms into what is called an "excited state." Generally, most atoms are in a ground state, and are less active in their movements, but the energy source that activates a laser brings about population inversion, a reversal of the ratios, such that the majority of atoms within the active medium are in an excited rather than a ground state. To visualize this, picture a popcorn popper, with the excited atoms being the popping kernels, and the ground-state atoms the ones remaining unpopped. As the atoms become excited, and the excited atoms outnumber the ground ones, they start to cause a multiplication of the resident photons. This is simulated emission. 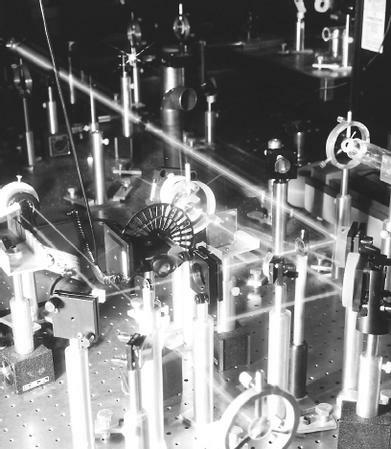 A laser consists of three components: an optical cavity, an energy source, and an active medium. To continue the popcorn analogy, the "popper" itself—the chamber which holds the laser—is the optical cavity, which, in the case of a laser, involves two mirrors facing one another. One of these mirrors fully reflects light, whereas the other is a partly reflecting mirror. The light not reflected by the second mirror escapes as a highly focused beam. As with the popcorn popper, the power source involves electricity, and the active medium is analogous to the oil in a conventional popper. the head of a pin. Semiconductor lasers (involving materials such as arsenic that conduct electricity, but do not do so as efficiently as the metals typically used as conductors) are applied for the intricate work of making compact discs and computer microchips. Gas lasers contain carbon dioxide or other gases, activated by electricity in much the same way the gas in a neon sign is activated. Among their applications are eye surgery, printing, and scanning. Finally, dye lasers, as their name suggests, use different colored dyes. (Laser light itself, unlike ordinary light, is monochromatic.) Dye lasers can be used for medical research, or for fun—as in the case of laser light shows held at parks in the summertime. Laser beams have a number of other useful functions, for instance, the production of compact discs (CDs). Lasers etch information onto a surface, and because of the light beam's qualities, can record far more information in much less space than the old-fashioned ways of producing phonograph records. Lasers used in the production of CD-ROM (Read-Only Memory) disks are able to condense huge amounts of information—a set of encyclopedias or the New York metropolitan phone book—onto a disk one can hold in the palm of one's hand. Laser etching is also used to create digital videodiscs (DVDs) and holograms. Another way that lasers affect everyday life is in the field of fiber optics, which uses pulses of laser light to send information on glass strands. Before the advent of fiber-optic communications, telephone calls were relayed on thick bundles of copper wire; with the appearance of this new technology, a glass wire no thicker than a human hair now carries thousands of conversations. Lasers are also used in scanners, such as the price-code checkers at supermarkets and various kinds of tags that prevent thefts of books from libraries or clothing items from stores. In an industrial setting, heating lasers can drill through solid metal, or in an operating room, lasers can remove gallstones or cataracts. Lasers are also used for guiding missiles, and to help building contractors ensure that walls and floors and ceilings are in proper alignment. Burton, Jane and Kim Taylor. The Nature and Science of Colors. Milwaukee, WI: Gareth Stevens Publishing, 1998. Glover, David. Color and Light. New York: Dorling Kindersley Publishing, 2001. Kalman, Bobbie and April Fast. Cosmic Light Shows. New York: Crabtree Publishing, 1999. Kurtus, Ron. "Visible Light" (Web site). <http://www.school-for-champions.com/science/light.html> (May 2, 2001). "Light Waves and Color." The Physics Classroom (Web site). <http://www.glenbrook.k12.il.us/gbssci/phys/Class/light/lighttoc.html> (May 2, 2001). Miller-Schroeder, Patricia. The Science and Light of Color. Milwaukee, WI: Gareth Stevens Publishing, 2000. Riley, Peter D. Light and Color. New York: F. Watts, 1999. Taylor, Helen Suzanne. A Rainbow Is a Circle: And Other Facts About Color. Brookfield, CT: Copper Beech Books, 1999. "Visible Light Waves" NASA: National Aeronautics and Space Administration (Web site). <http://imagers.gsfc.nasa.gov/ems/visible.html> (May 2, 2001).